Have I ever mentioned I love my scarves? I still remember that years back my mum used to laugh that I'd wear a scarf in summer if I could, and well, nowadays I actually do ;) Even if I don't have a scarf over my head, I feel a little bit more comfortable with my chest covered. And the scarves everywhere are so pretty, so why not? Recently I've received couple of beautiful scarves from Hidden Pearls - UK-based online hijab boutique. The business was launched in January 2015, after they found themselves struggling to find good quality hijabs without ridiculously high price tags attached to them. I totally agree - it can be really hard to find a good quality scarf that isn't overpriced, and the cheaper ones can be of really poor quality - last thing a hijabi needs is a scarf that will snag the first time you put a pin in it! They also felt it's unfair that some online shops seem to make extra profit on delivery charges, so they only charge the actual postage costs. Just by looking at their website you can tell they've put so much work into their business since the beginning, and now they offer an amazing selection. You don't need to shop around, as they have everything: chiffon, jersey, silk, lace... From plain-coloured to patterned, or with fancy borders. And you can get all your accessories there too, like pins and underscarves or headbands. When they asked me to choose some scarves, I was like "Yeah, no problem" - it actually took me quite a while to pick some favourites, I'd happily just say "Send over everything!". Sadly some of my favourites were out of stock at that time, but can't blame them for that - clearly I wasn't the only person to think they're the best ones! Anyway, I finally managed to narrow my choice down to two - I picked one Everyday Chiffon Hijab in Dusty Pink, and one Pearl Hijab that I got in Beige Brown. The chiffon scarf is a perfect choice for everyday wear. You definitely need a pin or two for this material, but it's really easy to style - and the quality is really good, no snags even though I've had quite a few attempts of different styles. 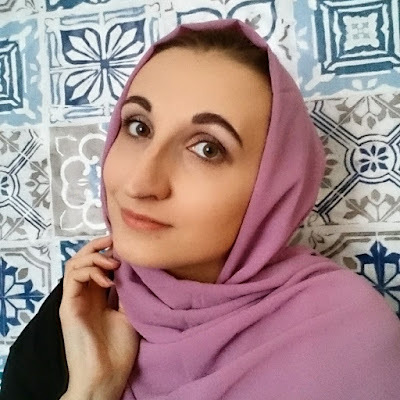 The pearl scarf is 100% viscose, and if I'm honest that's by far my favourite kind of fabric for hijabs. It's super soft and easy to style, and you can actually drape it without using any pins. And this one with pearl border is great for both everyday and occasion wear. In the photo above I just went for kind of relaxed everyday style, but with some playing around you can easily make it more fancy. I've also been wearing this one just around my neck recently - as I said in the beginning, I like to accessorise my outfits with scarves, and the pearls around the border make a great replacement for jewellery while keeping me covered as I like. I really can't recommend these scarves enough, and whenever I can justify buying more for my already massive collection, this will be my first stop! But that's not all - recently they added a range of Islamic gifts for the special ladies in your lives, looking to launch a range for children too. There's something for every special woman, for pretty much every occasion, from small items like a tasbeeh or candles to more elaborate gift boxes. My favourite is the Welcome to Islam gift box, which includes all the essentials for any new revert sister: 2 hijabs, underscarf, hijab pins, tasbeeh, some chocolates, prayer mat and a book. All the gift boxes can also have a handwritten note added at no extra cost, for that little bit more personal touch. *I was sent some items from Hidden Pearls Boutique for the purpose of this review. As usual, all opinions are my own and honest.